I’ve written extensively about how much The Real World San Francisco influenced me- you know, the season of MTV’s reality show that featured Pedro Zamora and his life with HIV. I wasn’t talking about HIV openly when that aired in 1994. I loved seeing Pedro meet new friends and speak so openly about his experiences. One of those new friends was aspiring cartoonist, Judd Winick. When he defended the comedic merits of The Three Stooges, I took notice. He seemed like a nice, thoughtful, guy. Back then, The Real World would cast people like Judd, who was hustling to get gigs and find love, which he did with housemate Pam. How Judd reacted to Pedro’s HIV status, with warmness, care and gentle curiosity, really made an impression. When I finally opened up and talked to my friends about HIV, they supported me in the same way. 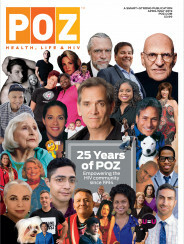 After Pedro’s passing, Judd dedicated his time to step in and fill Pedro’s speaking engagements, educating about HIV and talking about his friendship with Pedro. One of my favorite books is his graphic novel, Pedro and Me- it really showed me what the experience of The Real World was like, behind the scenes. The book brought me to tears. Judd has used his platform to explore themes that are of interest to the LGBT and HIV/AIDS communities. His graphic novel, Hilo Book 1: The Boy Who Crashed to Earth is out now. Seth Meyers says Hilo is “a perfect book for any kid who ever needed a friend and then had one with superpowers fall from space.” Big thanks and gratitude to Judd for showing me that friends would be there to support me when I was ready to let them in.